Geothermal Supercritical Carbon Dioxide (CO₂) Enhanced Oil Recovery© for Offshore and On-shore Applications by George E. Lockett—28th December 2012. George Lockett spoke at DecomWorld Conference - 9th North Sea Decommissioning Conference, November 21st - 22nd, 2012, Ardoe House Hotel, Aberdeen. Having seen the problems disposing of the Brent Spar oil platform, it is time to look for alternate uses for offshore platforms when it becomes uneconomical for them to continue production. One alternate use could be the extraction of geothermal energy. The continental shelf in the UK, where these platforms are situated, has a relatively thin earth's crust, giving the wells high bottom hole temperatures. Heat from these wells can be utilised to generate electricity and, by the use of submersible cables, help power the national grid. The extraction system utilises geothermal heat transferred from a hydrothermal reservoir into a combined Ultra-Large-Scale Heat Pipe/High Speed Organic Rankine Cycle Turbine. The system, which is called GEESOR (Geothermal Energy Extraction System Organic Rankine), overcomes the problems of reinjection, two-phase fluid movement and environmental pollution by using a clean working fluid in a closed cycle. The creation of a reservoir, fracturing and primary fluid movement will also be covered. The system described in this paper is an economical alternative to fossil fuels and nuclear power as the main source of electrical power generation for the next millennium. Governments around the world are constantly looking for new innovative forms of energy. 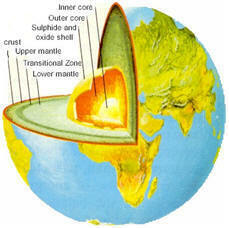 Geothermal energy has by far the greatest potential when it's put in context with the reserves of all forms of energy. When one looks at the planet on which we live, we see that all the fossil fuels, i.e. coal, oil and gas, come from the earth's crust. The crust makes up only 0.4% of the total mass of the planet, the remaining 99.6% being hotter than 500°C within the crust, increasing to 5000°C at the core. The pressures are constantly generating the heat naturally. This means that geothermal energy is infinite in its nature, as it is naturally renewable. The way the planet is constructed, in the form of a number of layers or shells, means that the heat can reach the surface without any trace of nuclear contamination. The radius of the Earth is 6000 kilometres. This distance from the centre to the surface forms a natural shield and is infinitely safer than any man made nuclear reactor. The system has been designed to extract geothermal energy out of spent oil and gas wells by the transfer of heat from the hydro-thermal field using heat pipe technology. The heat pipe transfers heat to the surface. The working fluid from the heat pipe is utilised directly in a high-speed organic rankine turbine system. The main innovation is the combination of these two separate cycles, the heat pipe connecting directly to the organic rankine cycle without the need for a heat exchanger. Work undertaken by Dr. G. Rice of Reading University1, has theoretically proved the compatibility of the two cycles and has shown very large increases in efficiency and power output, combined with reduced construction costs and maintenance. Special fluids operating in a hermetically sealed pipe system transfer the heat from the bottom of the well to the surface, by vaporising and moving at near sonic velocity. This vapour pressure is used directly to drive the turbo generator and is condensed, in an offshore situation by cold sea water, before returning via the feed pump to the base of the well. The minimum depth of the well needed to drive turbo generators depends on the geothermal gradient. In some cases this could be as small as 900 meters. It may be better to look at the minimum bottom hole temperature: this would be in the region of 150°C, although efficiency would be greatly improved with a bottom hole temperature of 400°C. The bottom 1000m of the well is normally fractured to allow the heat from the reservoir to transfer to the heat pipe. In a hydrothermal field, heat is transferred by convection circulation over the 1,000 metres of exposed formation. Additional angled drilling and hydraulic fracturing to aid this process could be utilised. The bottom 1,000 meters of the heat pipe is either rifled or has a capillary liner to increase the surface area and allow rapid expansion of the working fluid. The working fluid is sprayed from a return tube where condensed fluid is reintroduced to the evaporator surface. This allows the conversion of liquid to vapour to take place over a very large surface area. The vaporised fluid flows up the heat pipe to the turbine. Cooling water in the condenser provides a strong pressure differential across the turbine thus generating maximum power. 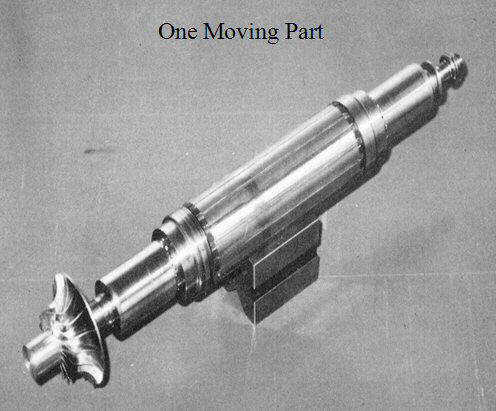 A small feed pump on the turbine shaft reinjects the working fluid to complete the cycle. The heat pipe effectively forms the heat exchanger between the contaminated fluids in the hydrothermal field, and only the clean working fluid is brought to the surface and recycles. The system should therefore have a working life of about 25 years, as there is only one moving part, that is to say, the combined turbine, alternator and feed pump floating on air bearing. Most geothermal power stations are based on two-hole extraction systems. This is because geothermal fluids are not pure and usually need re-injecting. There are many natural contaminants in the rocks, which if brought to the surface and released would cause environmental pollution. This removal of fluids itself causes a whole host of problems: corrosion, silting of wells, two-phase fluid movement, subsidence and many other lesser problems. With the single borehole system, pressure in the geothermal field is maintained. This has many advantages: hydrothermal fluids do not turn corrosive, and solids stay in suspension, hence no well silting. However, the most important claim is that there is no environmental pollution, unlike fossil fuels, which cause acid rain, and nuclear power, which produces radioactive waste. There are many areas of the world where reservoirs exist naturally2. These are usually associated with fault lines between continents and volcanic areas where hot springs, geysers and fumeroles are common. Recent research carried out in Russia in the Kola Peninsula has revealed moving fluids and open fractures at depths in excess of 12 kilometres. This discovery has led to a review of current deep geological thinking and has opened up the development of the single borehole geothermal energy extraction system. Foster3 has carried out work on the use of single borehole geothermal energy extraction systems in hot dry rocks. One of the major advantages of the single borehole system is that wells drilled for other purposes can be utilised for geothermal power generation. Some examples are unsuccessful or dried-up oil and gas wells and test boreholes. Normally, the high cost of these wells is written off, where as a simple test could show suitability for use as a geothermal power station before the well is plugged. The Single Borehole Geothermal Energy Extraction System makes use of low boiling point organic fluids. Therefore, wells which are drilled in areas not normally, known to be geothermally rich, with relatively low bottom hole temperatures, can be utilised. In areas like the North Sea, UK oil and gas drilling is carried out from platforms. Normally up to 20 wells are drilled from a single platform. Each year the oil output of these well falls by 5% and at some point in time they will be uneconomic to continue use for oil production. These platforms have the advantage that they are on the continental shelf, where the earth's crust is thin. High bottom hole temperatures combined with large quantities of cold seawater make them ideal locations for geothermal energy power generation. If it makes economic sense to connect the UK to France by cables to utilise cheap French nuclear power then it must also make economic sense to connect these platforms to the mainland to utilise geothermal power. 1. Rice, G. (1985), "Predicted Performance of a Heat Pipe/Geothermal Energy System for Energy Soft Computer Systems Limited". 2. Freeston, D.H. (1985), "The Application and Design of Downhole Heat Exchangers": Geothermics, Vol. 14, 2/3, pp. 343-351. 3. Foster, J.W. 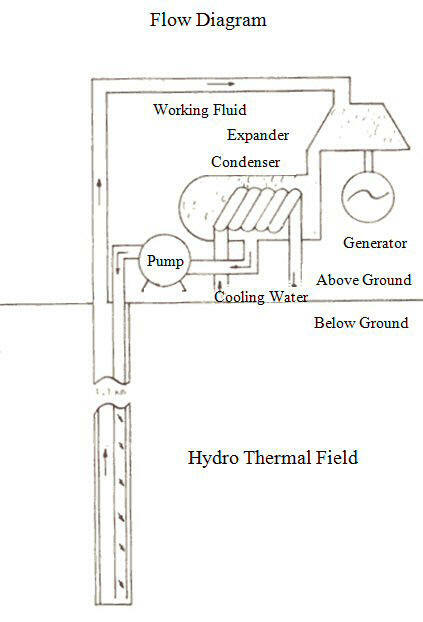 (1984), "Method for Producing a Geothermal Reservoir in Hot Dry Rocks Formation for the Recovery of Geothermal Energy": Author, Illinois State University. Abstract, Dr Rice, March 1985 for Total Energy Conservation and Management. Calculations were undertaken for a heat pipe operating at the following geothermal conditions. Two types of system were considered for converting heat to power using water as the working Fluid. *This may be increase to about 2 MW with improved screening of the liquid from the vapour at the exit section of the evaporator.